Pregnancy cravings can get pretty odd. Pickles and ice cream? Spicy foods? Don’t forget the loads of ice chips and chocolate. One craving that has several health benefits is fruit—kiwi in particular. Kiwifruit, which tastes a bit like a cross between a strawberry and a nectarine, is known for its petite size and fuzzy outer layer. It’s no wonder expectant moms love this adorable fruit. Kiwi not only tastes delicious, but it offers an abundance of health benefits for both mom and baby. Packed with vitamins and minerals, this superfruit is a great option to satisfy a sweet craving. Instead of reaching for that candy bar or bowl of ice cream, consider diving into a kiwi to experience these advantages. A common complaint among pregnant women is lack of sleep, often caused by having a hard time getting comfortable in bed and needing to get up frequently to empty their bladders. Kiwi is rich in serotonin, which is known to regulate mood and assist those struggling with insomnia. Acne can flare up during pregnancy, leading to skin redness and inflammation. 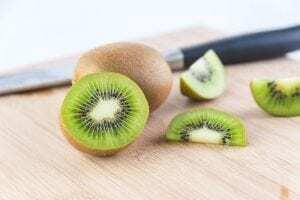 One kiwi can contain as much as 64 milligrams of vitamin C, which has been proven to help even out skin tone by aiding in the production of collagen. It’s also packed with antioxidants that are beneficial in reducing fine lines and wrinkles. One of the most critical nutrients pregnant women need is folate. Folic acid is a necessary part of cell development, and it helps to form a baby’s organs. It can also prevent complications like spina bifida and miscarriage. Prenatal vitamins usually contain folic acid, but the extra amount in kiwi can provide additional health benefits. Kiwi is on the low end of the glycemic index (GI), making it a suitable fruit for diabetics. Since gestational diabetes is a concern during pregnancy, consuming foods low in sugar can help reduce the risk of developing it. With just six grams of sugar in each kiwi, it can satisfy a sweet tooth without increasing the chance of developing gestational diabetes. Acid reflux and abnormal bowel movements are common complaints during pregnancy. Since kiwi is rich in fiber, stool is naturally softened, leading to easier bowel movements and fewer hemorrhoids. It’s also rich in prebiotics, which help to regulate the digestive system by producing good bacteria in the gut. In addition to being loaded with vitamin C and prebiotics, which help keep colds and the flu at bay, kiwi also contains phytochemicals. Phytochemicals keep a baby’s DNA away from damage while also preventing bacteria and diseases from invading an expectant mom’s immune system. To obtain the maximum benefits that kiwi has to offer, it’s recommended that one to three be consumed per day. Those who suffer from allergies to kiwi should avoid eating it. Pregnant women should always consult with their physician if they have questions about whether or not a certain food is safe for them and their unborn baby.